Been considering buying a luxury mattress but think they’re too expensive? Think again! Sit n’ Sleep makes it easy to get a great night’s rest on a top quality, luxurious mattress without breaking the bank paying expensive mattress prices. As a major supplier of high-end mattresses and accessories, each of our 39 Sleep Superstores conveniently located throughout Southern California carries a full line of name brand luxury beds, mattresses and accessories for sale at substantially discounted prices. Available in all sizes ranging from Standard Twin to California King and comfort levels from Cushion Firm to Ultra Plush, Sit ‘n Sleep has a luxury mattress in the right size and level of comfort to accommodate virtually any sleeper or sleep situation. What Makes a Mattress Luxurious? Selecting a conventional mattress is a relatively straightforward and easy task. Many people, however, find that shopping for a high end, luxury mattress can be much more complicated and possibly even intimidating. There are several factors other than price to take into consideration when shopping for a luxury mattress, including the mattress’s material, type of construction and quality of workmanship. This is where Sit ‘n Sleep’s professional Sleep Consultants come in. They’ll be pleased to help you navigate your way through the selection process, taking the mystery out of shopping for a luxurious mattress while saving you both time and money. Our experienced Sleep Consultants are available seven days a week to answer your questions, address your concerns and assist you with testing various luxury mattresses at each of our outlets. Sit ‘n Sleep’s Consultants will point out and explain the various features of each luxury mattress we sell, and if requested, will offer honest and unbiased recommendations as to the ideal luxury mattress for your unique sleeping situation. Luxury mattresses are painstakingly constructed from state-of-the-art materials for the ultimate in comfort, support and a truly restful night’s sleep. Sit ‘n Sleep offers an extensive selection of luxury mattresses from well-known manufacturers such as Tempur-Pedic, Stearns & Foster and Beautyrest. Some examples of luxury mattresses for sale at all Sit ‘n Sleep outlets include Spink & Edgar Alpaca 7000 Luxury Firm Mattress, which contains material pads of natural Alpaca, Yorkshire Wool, Egyptian cotton, hemp and flax, the Aireloom Bel Aire Plush Innerspring Mattress and the Technogel Estasi Cushion Firm Foam Mattress. As the name implies, a luxury mattress offers a luxurious, more comfortable sleeping experience than a conventional mattress. Available in a full range of softness and firmness levels, a luxury mattress correctly matched with the individual sleeper’s needs will improve his or her quality of sleep, such as providing relief for back pain sufferers by helping to properly align and support the spine, neck and shoulders. Luxury mattresses are constructed from the finest materials available, which under most circumstances will extend their useful life, particularly if they are paired with one of Sit ‘n Sleeps quality mattress protectors. Luxury mattresses are often also hypoallergenic, which is a feature greatly appreciated by asthmatics and allergy sufferers. Start enjoying the same level of comfort and restful sleep at home as you might experience while vacationing at a five-star hotel or world-class resort. After all, one-third of life is spent sleeping, so why not treat yourself to the best and experience truly luxurious sleep in your own bedroom? You deserve it. Being at the upper end of the spectrum, luxury mattress choices initially seem somewhat limited when compared to conventional mattresses. Sit ‘n Sleep Mattress Superstores, however, have an extensive inventory of luxury mattress choices sure to include one that’s just right for virtually every sleep situation. 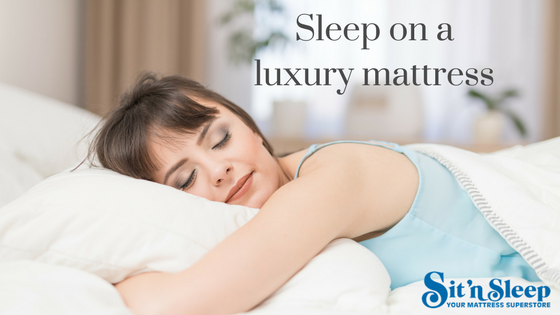 Our inventory of luxury mattresses is updated frequently to ensure Sit ‘n Sleep customers always have access to the perfect luxury mattress at the best possible price. A visit to a nearby Sit ‘n Sleep outlet will give you an opportunity to physically test and experience the various luxury mattress comfort levels and construction types. If you’ve decided a Luxury Mattress is right for you, but don’t feel it’s within your budget right now, no worries! Apply for special financing through Synchrony Financial (subject to credit approval) either in the store or by telephone at 800-908-0354, and receive an instant decision. Bring your approval to any Sit ‘n Sleep outlet, speak with a Sleep Consultant, purchase your Luxury Mattress and get ready to start enjoying the most luxurious, restful sleep you’ve ever experienced.